Building a simple and easy microcontroller based robot is always a fascinating topic to be discussed, especially for the robotics newbie enthusiast. On this tutorial I will show you how to build your own microcontroller based robot which known as a photovore or you could call it as the light chaser robot using the simplest possible circuit for the microcontroller based robot brain, locomotion motor and the sensor. One of the most frustrating parts when building your first microcontroller based robot is to program it and to download it into the microcontroller flash ram. 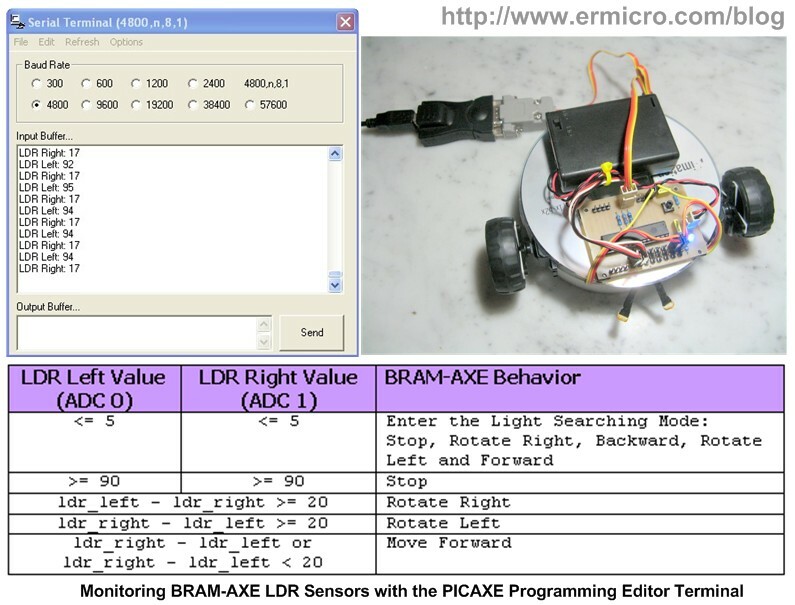 On this tutorial this kind of “trouble maker” is being reduced as we will use the PICAXE programming editor from the Revolution Education Ltd (http://www.rev-ed.co.uk/picaxe) as our Integrated Development Environment (IDE) to program our robot brain using the BASIC (Beginners All Purpose Symbolic Instruction Code) language and to download the program into the PICAXE 28X1 microcontroller. The PICAXE 28X1 microcontrollers actually is based on the popular Microchip 8-bit 28 pins PIC16F886 microcontroller that have a preload PICAXE BASIC interpreter firmware inside, in fact when you buy it its looks the same as the usual Microchip PIC16F886 microcontroller. Together with the free PICAXE Programming Editor and simple serial cable connector for the program downloader makes this PICAXE framework suitable for beginners and even for the professional. You could read more information about the PICAXE microcontroller on my previous posted blog “Introduction to the Embedded system with PICAXE Microcontroller“. 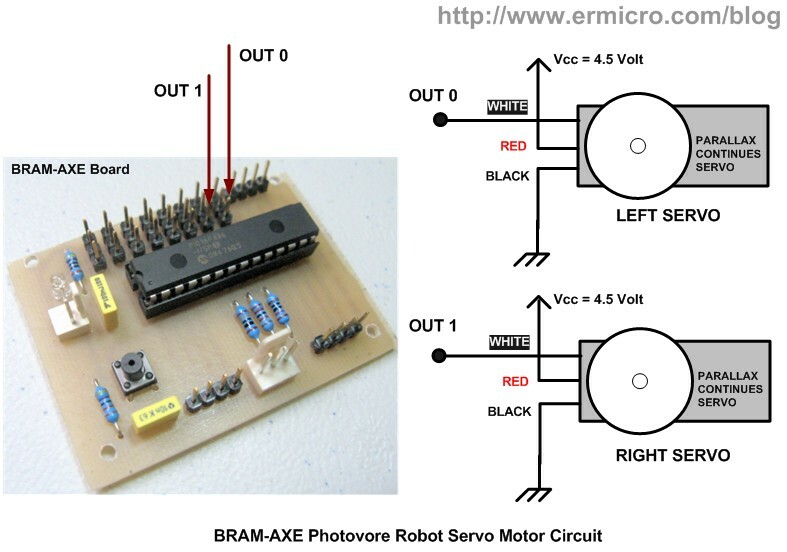 On this tutorial I will refer this photovore robot as the BRAM-AXE as this is a simplify version of the more advanced version of its big brother BRAM (Beginners Robot Autonomous Mobile) which you could read more information about it on my previous posted blog “Building BRAM your first Autonomous Mobile Robot using Microchip PIC Microcontroller – Part 1” and “Behavior Based Artificial Intelligent Mobile Robot with Sharp GP2D120 Distance Measuring Sensor – BRAM Part 2“. 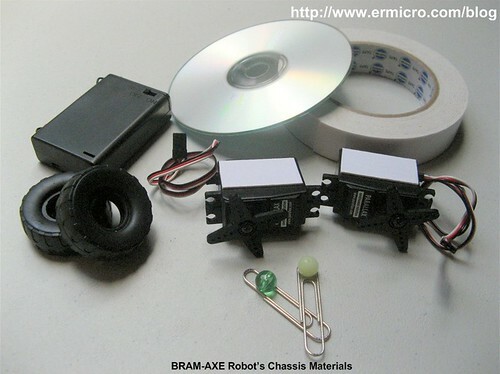 The BRAM-AXE robot simply use its light sensitive sensor to navigate to the light source, when it being placed in the dark environment it will automatically switch to the light search mode and try to find the light source, when it encounter the light source it will navigate to the light source and when the light source intensity is bright enough it will stop and enjoying the light. You could see all this behavior on the video at the end of this tutorial. Ok now let’s list down all the electronics parts, robot chassis materials and software needed to build this interesting robot. BRAM-AXE board: based on the PICAXE 28X1 microcontrollers together with the PICAXE serial downloader cable which you could easily build from my previous posted blog “Make your own Microcontroller Printed Circuit Board (PCB) using the Toner Transfer Method“. 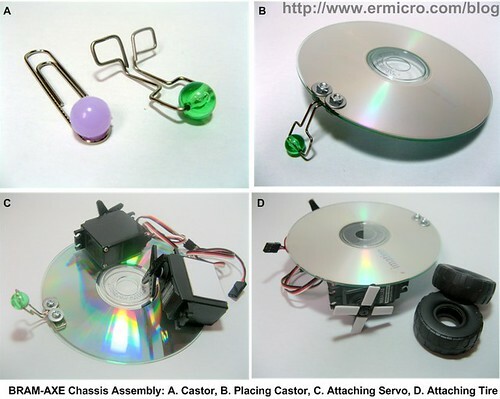 The BRAM-AXE main chassis is made from the CD/DVD which you could find easily at home or just use the blank one as I did if you don’t have any discarding CD/DVD at home. For the wheel you could use any toy’s wheel or you could use anything that has a circle form as long as the diameter is greater or equal to the servo’s arms. Now attached the 3 x AA battery holder and BRAM-AXE board on top of the CD; again using our flexible friend the double tape as shown on these following pictures. Connect the power socket to the BRAM-AXE polarized power pin and the servo’s socket to the BRAM-AXE board output 0 and output 1 three pins socket respectively as shown on this following servo’s circuit diagram. The BRAM-AXE board output pins is design to be attached directly with the servo, every output pins provide both power and ground needed to power the servo. Connect the left servo connector to the BRAM-AXE output 0 and the right servo connector to the BRAM-AXE output 1. After finishing all this steps now it’s the time to test the robot steering mechanism. 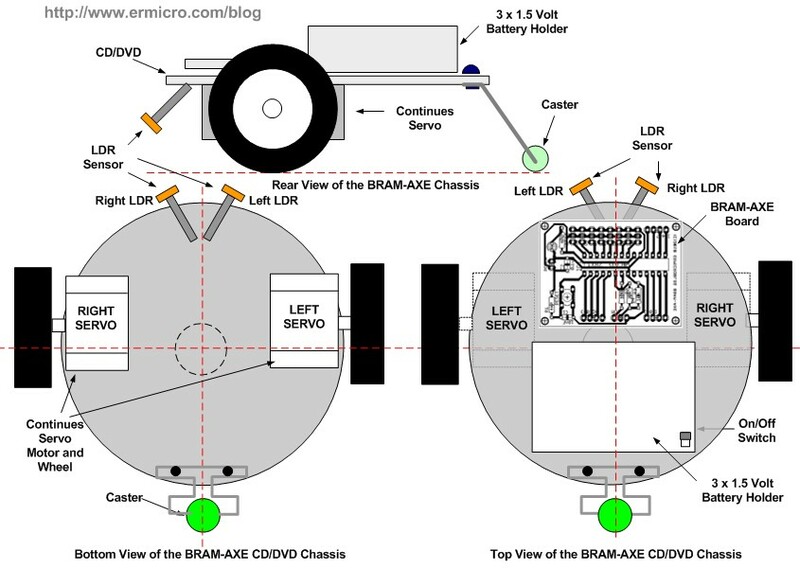 The BRAM-AXE steering use the simple method called the “differential drive“; when the two servos rotate on the same direction the robot will move forward or backward, and when they rotate on different direction (counter rotation to each other) the robot will rotate to left or right. Servo basically is a high quality geared DC motor with electronic circuit for controlling the DC motor rotation direction and position; its being used widely in model hobbyist such as car R/C model for steering and acceleration control or airplane R/C model for moving the rudder, ailerons, elevators and acceleration control. Typically there are two type of servo available on the market the first one is “standard” servo which could rotate between 120 to 180 degree and the second one is “continues” servo which could rotate 360 degree. By using the continues servo, the locomotion circuit become very simple as we only connect the servo directly to the BRAM-AXE board and supply the correct PWM (Pulse Width Modulation) signal in order to make it rotate. The PICAXE BASIC language has a build in servo commands that we could use to make the servo rotate. The servo command will initial the PICAXE 28X1 (Microchip PIC16F886) internal TIMER which is used to generate the PWM signal to the servo and after initialization you have to use the servopos command in order to control the servo. The n is the number between 75 and 255, where this number will determine the servo rotation direction (clock wise or counter clock wise). The output_pin is the PICAXE 28X1 output pin which range from 0 to 7. Usually the servo is designed to have a wide tolerance on the incoming PWM signal, but if your servo doesn’t work with the above value (125 and 200) try to experiment with other value as long as the value range is between 75 and 255. For more information about controlling the servo you could read my previous posted blog “Basic Servo Motor Controlling with Microchip PIC Microcontroller“. 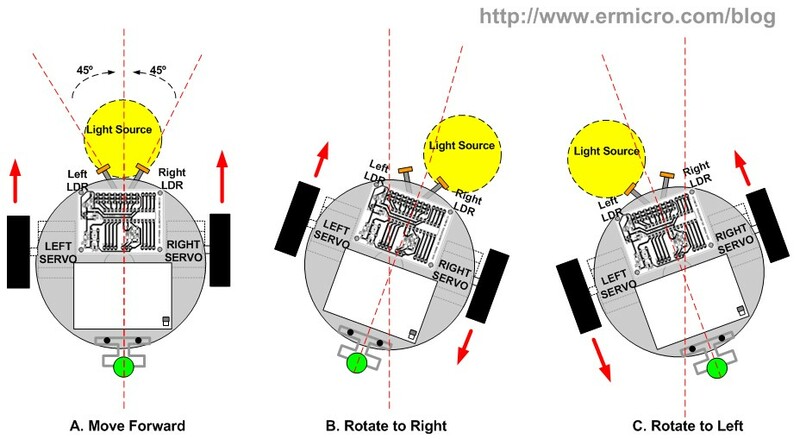 In order to make the complete photovore robot, we need to use the light sensitive sensor; the simple and cheapest one is to use a special made resistor (made from Cadmium Sulfide) called Light Dependent Resistor or LDR for short. The LDR will vary its resistance according to the light intensity fall on its surface; the bright light intensity will make its resistance decrease significantly (about 1K Ohm to 5 K Ohm) while on the completely dark its resistance will increase as high as 100 K Ohm. 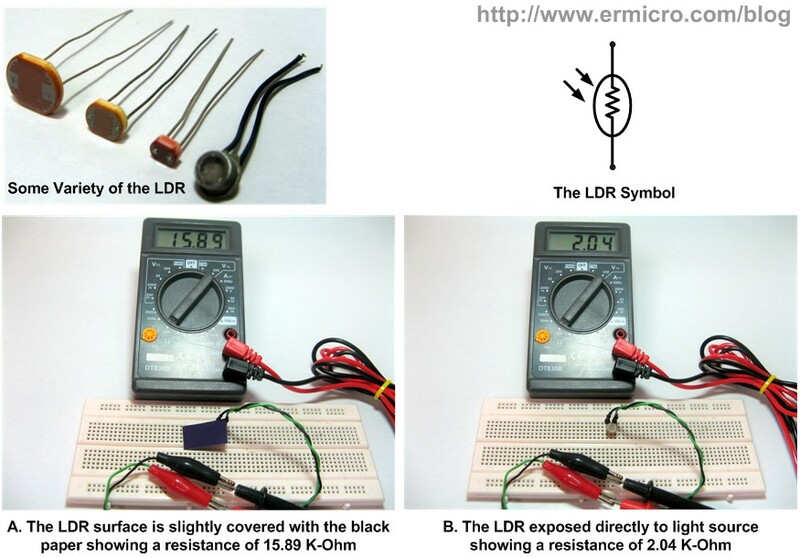 By connecting the LDR in series with 1 K Ohm resistor, we could get the simplest possible light sensor circuit that will give us the variable voltage output according to the light intensity as shown on this following picture. This simple circuit is known as the voltage divider circuit, you could read more information about the voltage divider circuit on my previous posted blog “Basic Resistor Circuit“. When both LDR sensors is quite dark than we command the BRAM-AXE to enter the light search mode, this light search program algorithm will keep the BRAM-AXE to move forward, backward, rotate left and right until it locate the light source. 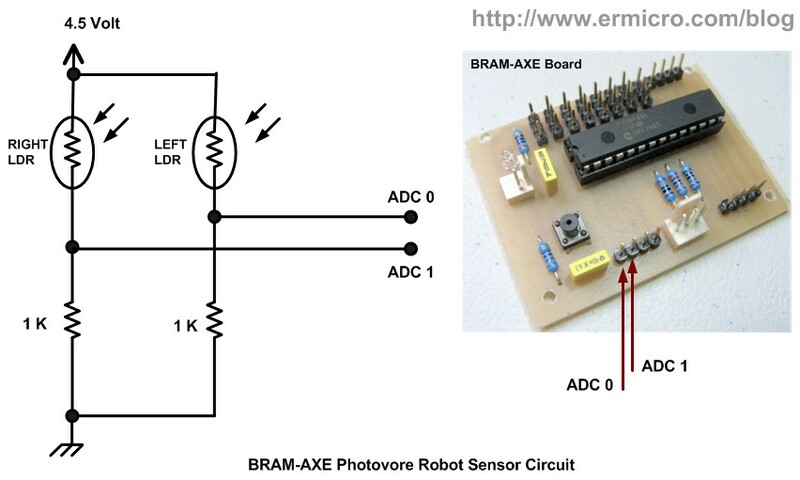 The BRAM-AXE photovore program algorithm use the simplest steering method control called the bang-bang control or on/off control which is the simplest closed loops control method usually used in the embedded system. For more information about the bang-bang control method you could read my previous posted blog “Basic Servo Motor Controlling with Microchip PIC Microcontroller“. 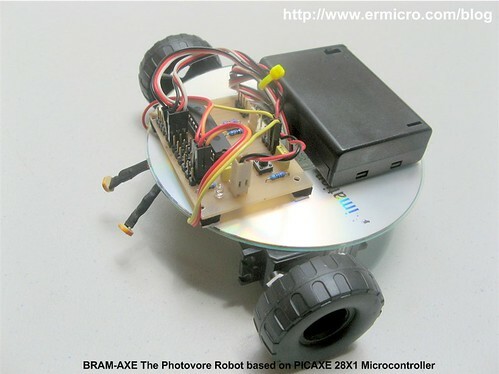 As you’ve learned to build this simple and easy to build photovore robot hopefully this will trigger your passion to learn more about robotics and the embedded system. Learning by experiences is the key to success in learning the embedded system, keep experimenting as this will build your understanding and confidence in developing your own embedded system project. Hi rwb, its me again. Now i have been reading the blogs you suggested for using a transistor as a switch and am still working on that end. I have another question. i have another project that i have been given to work on. There is to be a microcontroller that accepts input from two sources, a keypad and a thumb reader. Then the thumb print is compared aganist a database and if a match is found there is a output to a display in form of a message, so the controller also outputs a to a display. I was thinking any microcontroller with an ADC capability should work. Am i right? Also it possibe that the microcontroller can comunicate with a system where the database is stored while its functioning? The thumb or fingerprint reader usually use the DSP (digital signal processor) class microcontroller for processing the image. If you want to start work with the fingerprint project; my suggestion is to use the ready made fingerprint module available on the market which give you the image read, store and search capabilities. Usually this module will communicate through RS232 or SPI. For the finger print image processing there are already available module in the market, although building this type of module from scratch is possible but definitely need more skill and time. Ok, it seem to me that you want to build something similar to the time attendance machine and because this topic is not related anymore within this post, therefore I will email you directly my comment. can i make wall avioding robot with this pcboard? 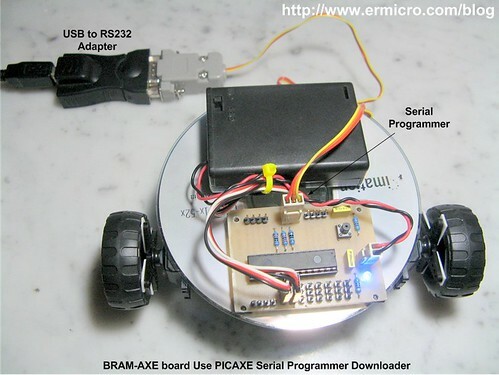 Yes, in fact you could use this BRAM-AXE board (PICAXE 28X1) for any robotics project and connect the Sharp infrared range to one of its ADC input. If you want to use the geared small motors you need to use the motor driver. You could not connect the motor directly to the PICAXE 28×1 microcontroller output port. Unlike the BRAM-AXE board the original PICAXE 28×1 starter kit board is equipped with the L293D motor driver chip. can i use it for this project? may i know what is the assembler code use to run this robot? because base on the example code given above is C code.. In this project I used PICAXE BASIC language not a C code and because it used the PICAXE microcontroller therefore you could not program it with C or Assembler code. I want ur help more what will be the difference in code if use this as line follower and an edge avoid er? For the edge avoider you could simply use a switch which constantly close (logical high) on the normal surface (pressed by the robot’s chassis), but when on the edge the switch arm will simply fall because of gravitation and the switch will open (logical low). Base on this logical information you could program the robot to avoid the edge. How can i connect a pir on this board ? how many pins have a pir? what will be its values? Can I use for ldr ir ldr and for led a ir led for a line follower? my new notebook have not 9 pin port, can connect this board with it? The DC motor is different compared to the Servo Motor. Basically the servo Motor is a geared DC motor with special electronic circuit inside, therefore the code have to be changed. The PIR (Passive Infrared) sensor circuit basically will give you logical “1” (ON) output when it detect the object or “0” (OFF) when no object is detected, therefore you could connect to any digital input port. Yes you could use IR (infrared) instead of LDR for the line follower robot sensor. You could buy the USB to RS232 converter for connecting this board to your notebook (I used it in this project, see the picture above). I have tryed making this robot this week, my only problem is when I try to download the program onto the microcontroller I get an error saying that there is an error with my COM port. I have read somewhere that there might be a problem and the cable will not work if i do not have a 5Volts power supply so I ended up checking that as well and it is 5V. I am simply out of ideea. Any chance you might have an ideea about what’s going on? nvm, managed to fix it. hi, im from malaysia and im took light chaser robot as my final year project. can u pls upload me c-programing source code for this project..pls its very urgent..
and also im not using picaxe ..im use pic16f886. Can I get the full programming link or file ready??? I will start the implementation of this project from scratch Do I need information not found the explanation above? Sure you can, all the information required is already explained in the articles (see the necessary link for additional information) and you could just copy/paste the PICAXE BASIC code from the article above. No, you could not use ordinary Microchip PIC Microcontroller (i.e. 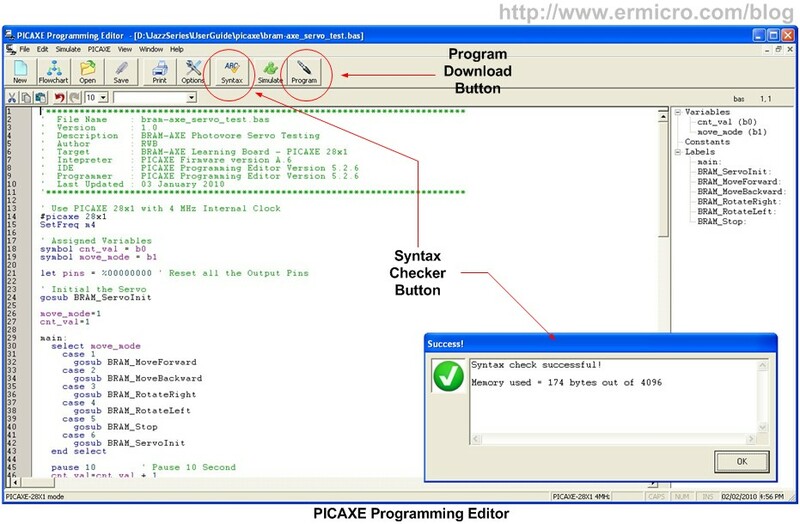 PIC16F877A) to program with PICAXE BASIC Integrated Development Tools (i.e. using PICAXE BASIC language), unless you plan to use other development language such as Microchip C or Assembler. See the article “Introduction to the Embedded system with PICAXE Microcontroller” in order to understand what is the PICAXE Microcontroller.